I like Mike Rowe. Rowe, the host of the Discovery Channel’s Dirty Jobs and the new CNN program, Somebody’s Gotta Do It, is a complex guy. A former opera singer (really) and host for QVC (has great stories about Joan Rivers), Rowe has become an outspoken proponent for the blue collar jobs and workers in recent years. Last fall, Rowe did an interview on reason.tv to talk about higher education. Rowe believes that we oversell higher education, out of fear, in part, that a higher education is the solution to most career and workforce evils. In his 10 years doing Dirty Jobs, Rowe met many people doing, well, dirty jobs who had higher educations, but found that they could either make more money, or have better standards of living, than they would be through their chosen profession/education. Rowe talks about his own experience in the high school counselor’s office, and shows the poster below about how we think and feel about trade work versus college work. These are the jobs, he says, that parents don’t want to discuss with their children because they want what is “best” for them, and we’ve been conditioned to think that college, as in a four-year degree, is the best thing for them. Rowe comments that there are 3 million unfilled jobs in the workforce right now, and they are mostly construction and other blue-collar type jobs. Rowe calls this an inconvenient truth in the current narrative that unemployment and unfilled jobs mean that we need more education. The $1 trillion that Rowe mentions is the $1.2 trillion in total college debt, according to Forbes magazine. In 2012, 71 percent of college graduates had student debt averaging $29,400 per borrower. In total, Federal Reserve Bank of New York suggests there is in excess of $1.2 tillion in college debt. Put in perspective, the entire US federal budget was $3.45 trillion in 2013, so student debt covers over one third of the US budget. Rowe doesn’t just fling this stuff. He backs it up. He created the Mike Rowe Works Foundation, which “promotes hard work and supports the skilled trades” while awarding scholarships to students attending schools such as the Midwest Technical Institute, Tulsa Welding School, The Refrigeration School and Universal Technical Institute. As part of his Foundation, he runs a website called “Profoundly Disconnected,” which challenges the “absurd belief that a four-year degree is the only path to success.” On the web site is the Trade Resource Center that provides clickable resources in all 50 states for training and educational programs, including financial aid. I like Mike Rowe. And I think he has a considerable point; one I’ve been discussing for quite a time, as most of our readers know. Quite simply, we oversell higher education through parental fear. We goad people into thinking that a BA is the only way forward. I’m guilty. I’ve goaded. I’ve fallen for it. And I’m paying an awful lot of money for my children to go to college without any assurance of what will happen once (and hopefully) they graduate. They don’t have any student debt and nor do I, but it has and will continue to have implications on my retirement funds and outlook. I see families across the country who face the same thing. College, four-year graduates either unemployed or working in a field that has zero to do with their education. And I cannot list on my two hands the number of 20-somethings I personally know that hold at least $30,000 in student debt notes. What do you think of Mike’s perspective? Right? Wrong? Indifferent? I’d want to know more about the 3 million unfilled jobs Rowe refers to. Are their pay and conditions similar to filled jobs? How easy is it to get trained for those jobs? Are employers contributing much to their training needs? Good question, and I don’t know. Something to consider. 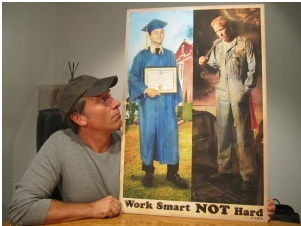 Interesting article… Does Mike Rowe have a degree? Did his children (if he is a parent) go to college? Higher education is not job training. While the return on the investment may not always satisfy everyone, how many graduates say they wish they had not gone to college? Dear DP: As far as I understand, Rowe went to Community College, dropped out, and later graduated from Towson with a degree in communication. So, yes, he went and did the dance. I do not believe he is married or has kids, like me. I think his argument is solid, but it is different when you have to make those decisions for your kids. 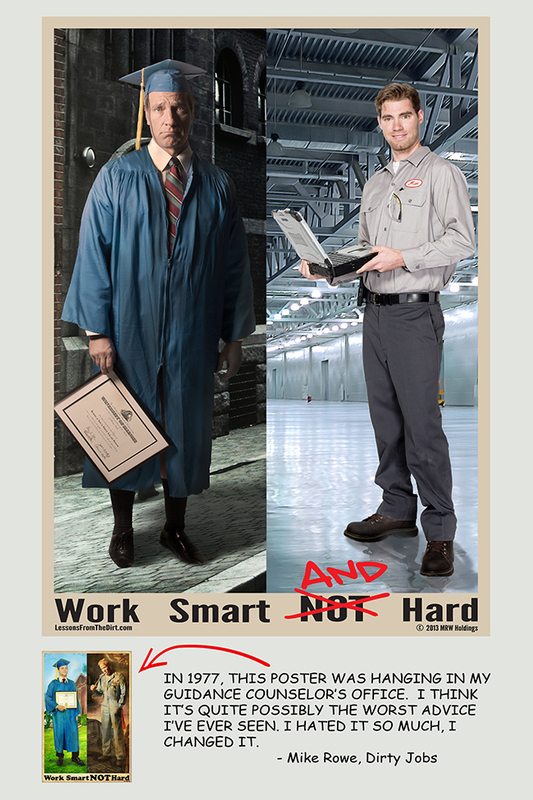 Regarding your comment that higher education isn’t vocational… it surely is. Some academics would like to believe otherwise, but we wouldn’t “do” higher education if it wasn’t vocational. Maybe the blue bloods back three hundred years ago did it for the reasons of mental acuity and overall wellness, but today people go to prepare them for jobs. Lawyers, accountants, doctors, nurses, you name it, it is ultimately vocational preparation, so I don’t buy your argument at all on that one. The argument how many graduates say they wish they had not gone to college is also fallacious in many ways, although I bet there are thousands of people who went to college and DID NOT COMPLETE that wish they never went. And I bet there are many that completed and are holding $75k in loans that wish they didn’t go as they try and make ends meet on $32k/year. That is the reality. And the argument still doesn’t suggest that more should go, or even as many as we send should go. Separate issue. Towson university was founded and played for by the state of Massachusetts to be tuition free. I guess I was wrong to assume one with a communication degree would think before he speaks/writes/upchucks. Then again I guess history is not his strong suit. His vocational training bit is not wrong, however technical “college” is vocational training. Another failure of communication on his part as he should have said “bachelors or masters degrees”. Towson University is not in Massachusetts. It’s in Maryland. Towson is a suburb city of Baltimore. I taught there for 16 years. With that said, there’s more to job training than meets the eye, and most CEOs will tell you they wish today’s job applicants had better communication skills, i.e., the ability to express themselves logically and competently in written and spoken English. In a welding class, you learn to weld. In truck driving school, you learn to drive a truck. If technology advances to the point that welders or truck drivers are no longer needed, the welders and truck drivers are just out of work people without the background to find other employment (other than low wage jobs) elsewhere. I remember when key punch operators were in demand back in the 1960s. Where are those people today and what are they doing? And where will the truck drivers be when unmanned trucks take over? Advances in technology are coming so fast today that the greatest assets young people have are flexibility in employment and the critical skills necessary to adapt to new conditions. And these are the abilities they gain from earning college degrees. My three daughters all have college degrees, and all of them are doing well because they do have these abilities. Even Mike Rowe would have to tell you that his communication degree has served him well in his professional life. Otherwise, he might be a welder for a company that decided to move its operation overseas because labor is cheaper over there. He went to a traditional institution, went into television, and only learned about real work when he got to play at it on TV. Now he tells young people to forget about college and go work in the dirt(presumably he leaves off the the “peasant” at the end.). His concern about the debt is touching, until you realize that he partners exclusively with FOR PROFIT educational institutions that have price gouged the government. UTI was found by Congress to be grossly over charging for the education it provided. You could get the same education at a community college for half the cost. But, when you get kickbacks from “schools” (the kind reputable institutions aren’t allowed to give) suddenly you become a proponent. Its hypocritical and self serving.